Josh Sizemore is proof that no industry is too big to disrupt. It’s all about the way you look at the problem you’re trying to solve. After establishing a high profile career as a brand executive in leading Fast Moving Consumer Goods (FMCG) companies in the US, Josh was on the way to becoming a CEO, before he had his “aha” moment. 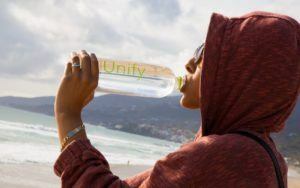 I was lucky enough to catch up with Josh, where he shared his journey with me and why he believes Unify Water will one day become a household brand name. Josh founded Unify Water on the premise that consumers are being misinformed: Misinformed about the quality of the bottled water they are drinking. “Many brands filter or purify tap water and mark it as a superior product.” The global bottled water market is surging at the moment and is expected to reach USD $279.65 billion by 2020 . Additionally, the top premium water brands in the US bottled water market are imported from outside of the US. With his entrepreneurial instinct, Josh sensed an opportunity to take action, but he was still missing the most important element, where would the water be sourced? Through a completely chance conversation with an old colleague, Josh heard about an “untouched aquifer in Tennessee”. After inspecting the source, Josh found out it produced 10 Million gallons per day (37 million Litres) while maintaining a year-round 54 degree temperature with a natural pH of 7.3–7.6. The water source is also the only one now to be “certified by the USDA in America to drink from the ground”. Josh realised that even with a great brand name and high quality, great tasting product, Unify Water would not stand a chance unless it had a major differentiator over the rest of the pack. This is where Unify Water created the H2O Initiative: a pitch to the consumer’s sense of altruism. For every bottle consumers buy, the company provides a gallon of water to communities in need, around the globe, serving people in underdeveloped communities both locally in the US, as well as overseas. Unify Water does this by partnering with non-profits, like The Water Project. These partnerships ultimately allow Unify Water to fulfill its brand promise internationally, providing millions of gallons of clean water to people in the most water stricken communities around the globe; but equally as important, they also provide water to the under-serviced local communities within the US. Unify is also working with the US government to be the first point of contact for water relief for any natural disaster. They have even taken the “give back” proposition a step further, by adding technology to their online platform. When someone purchases a bottle of Unify, they can then go onto unifywater.com and select the “Give Water Now” button. This brings up the “Map of Impact” which has the US (by state) and International (by country) locations that the consumer can give water to in real time! This allows consumers to have a more meaningful and emotional interaction with the brand. Just as we’ve seen with Thankyou in Australia, businesses that can put altruism and authenticity at the core of what they do, have a far greater chance of building a community of loyal followers, who will, in turn, become their most vocal brand ambassadors. But it hasn’t been smooth sailing for Josh; he’s been bootstrapping this project to the point where he “takes friends and family to the plant to help bottle water 3 times a week.” He also likens the “roller coaster journey” of entrepreneurship to being a performer; “you hear a million no’s and you wait for that one yes, that’s what it’s all about.” But he does have some suggestions for getting more “yes’s.” “It comes down to your story and your message; this is what has allowed us to get over the humps along the way.” It certainly isn’t impossible to succeed without a great story, but a great story certainly gives you a better chance. Josh has grand plans for Unify Water with the goal of being a globally recognised brand within 5 years. He also sees social media as a key enabler in the future success of Unify Water. “The internet is an incredible leveler. We now have the ability to share our story with the world; social media is the toolbox to do it.” It’s pretty clear that the Unify Water story is just getting started and it’s going to be a fun one to follow. The company is currently raising $5M in capital to expand and grow their retail presence, from 2500 stores to 10,000 within the US. There’s opportunity everywhere; the key is to focus on solving a real problem that easily resonates with people other than yourself. Whether you are for profit or not for profit, place altruism and authenticity at the heart of why you do what you do. Be nice to your family and friends, you never know when you might need their helpful hands on the production line! If you’d like to learn more about logistics and how you can take the next step in your career, check out Monarch Institute’s nationally accredited course here.